Ten years ago, Antonia Alvarez bought a place of her own for $6,000. She moved her kids out of a cramped south Minneapolis apartment, bought some plastic patio furniture for her new porch, and realized now she had a lawn to mow. Her house is a single-wide mobile home. It's small, and the lot is small, but "so am I," she says. 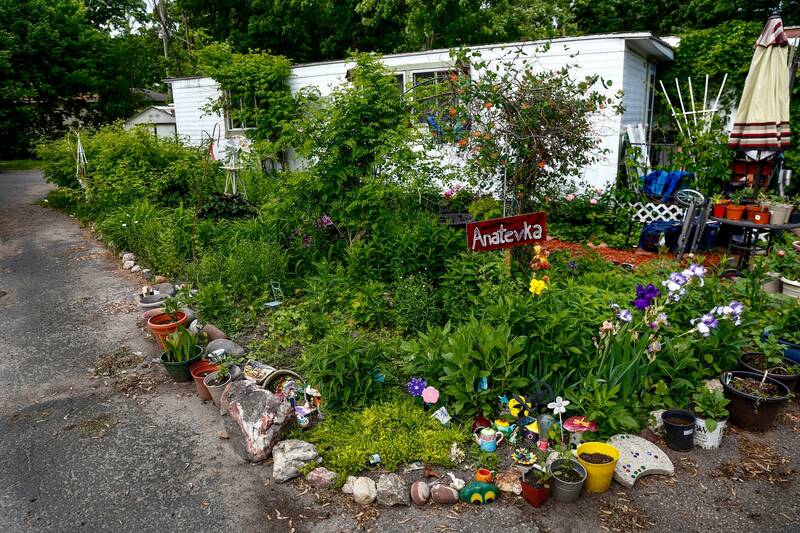 It's parked — or planted — in Lowry Grove, a mobile home park in St. Anthony, Minn. The 15-acre park is tucked in the southeast corner of the suburb; Minneapolis is just across the street. Alvarez's mobile home is older than she is. It rolled off the factory line in 1962, and from the day she moved in, she's been fixing it up. New windows, new fuse box, new cabinets. New stove, new microwave, new fridge — an upgrade from the original 1962 model that was still in the house. She realized she'd have to fix the home's floors when her youngest daughter, Melina, kept hitting a snag under the carpet as she rode her tricycle back and forth in the living room. She pulled back the carpet — and fell through the floor. Only the carpet had been keeping it together. It was raining outside when she fell, Antonia remembers, because that's also the day the roof began to leak. She replaced that, too. The bathroom wall is one of the only original things left, its classic gold starburst pattern a last remnant of the '60s. By Alvarez's count, she has put more than $30,000 into the home over the decade she's lived there. And her list isn't done yet. She was planning to put in a new furnace this winter. "It's my plan," she said. "But now it's no more plan." This winter will be Lowry Grove's last. In April, residents received a letter saying the 70-year-old park will be sold and closed. Homes that can be moved will be towed to other parks, but many, like Alvarez's, are too old. They'll be demolished. Minnesota statute 327C.095 governs the closing of mobile home parks: Residents must receive at least nine months' notice of the closure. A public hearing must be scheduled. Displaced residents may be eligible for payments from the Minnesota Manufactured Home Relocation Trust Fund. Payments could range from $2,000 to $20,000. 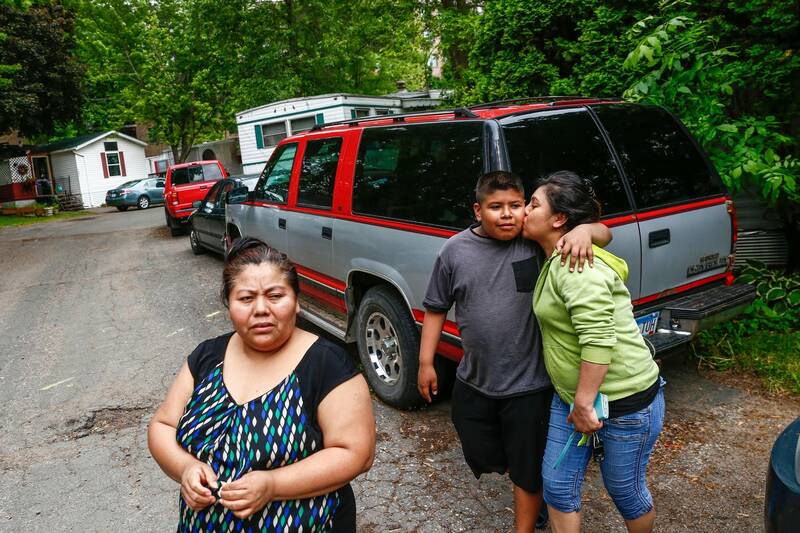 And there's a right of first refusal, buried in the law: a Hail Mary no one in Minnesota has ever pulled off — a last-ditch effort that would keep Antonia Alvarez in her corner lot, under the big trees. She's determined to do it. She just needs $6 million. The right of first refusal gives park residents the opportunity to organize and buy the park themselves. Fifty-one percent of the homeowners must sign on, and they have to match the terms and conditions of the buyer's offer. For Lowry Grove, Continental Property Group offered $6 million. Other mobile home parks in Minnesota have been purchased by their residents. Northcountry Cooperative Foundation, based in Minneapolis, has helped eight parks form co-ops and transition to a resident-owned model. More are in the works. But none of those parks were under a purchasing agreement, like Lowry Grove. They had the time to seek out financing, said Warren Kramer, Northcountry's executive director. Under the right of first refusal, Lowry Grove residents have just 45 days — ending Saturday. To meet the deadline, Alvarez has rallied her neighbors. Many are immigrants, like she is. Single mothers. Retirees. There's a woman whose husband was deported last year — Lowry Grove is the last place they lived together. There's a man who bought his trailer 30 years ago, and thought he'd stay there until the end. 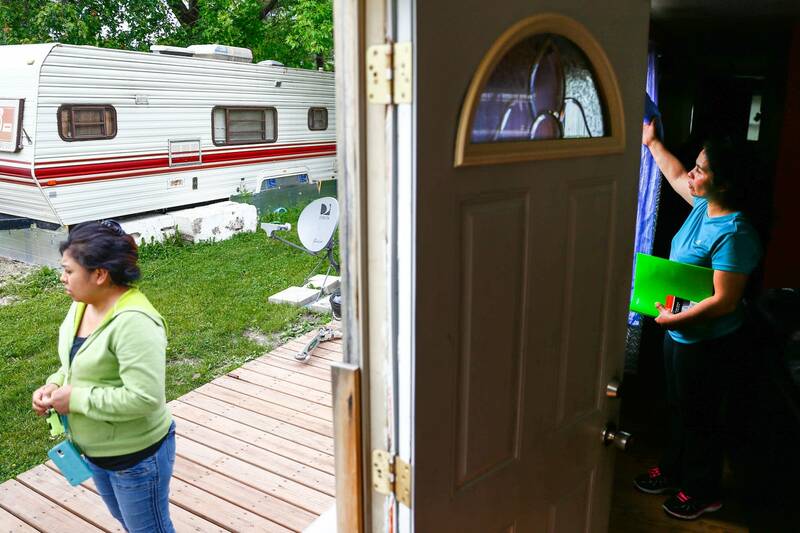 In all, 95 mobile homes are planted in Lowry Grove, and those who aren't ready to let it go have gathered on Alvarez's porch every Friday since those letters about the sale were sent out in April. Organizing like this is what Antonia Alvarez does: putting the call out, rallying people behind a cause. Ten years ago, just after moving into Lowry Grove, she co-founded Asamblea de Derechos Civiles, a nonprofit focused on the issues of immigration reform, transportation access and housing. She cleans houses to pay the bills, but Asamblea is her passion. She organizes rallies and campaigns on issues critical to low-income and immigrant communities. 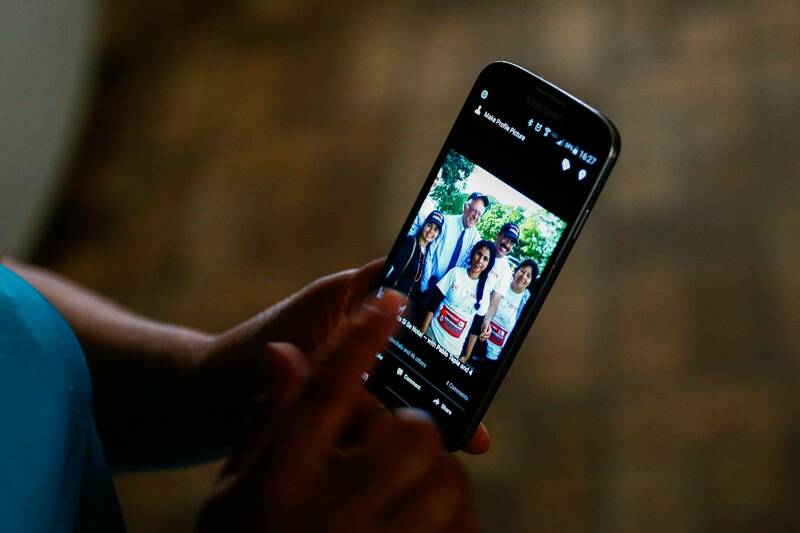 She flips through her phone, past pictures of her standing with U.S Rep. Keith Ellison, Sen. Bernie Sanders, President Barack Obama. For the Lowry Grove campaign, she keeps a whiteboard leaning against a tree by the park's main drive, updating it with the latest developments: "Meeting Friday." 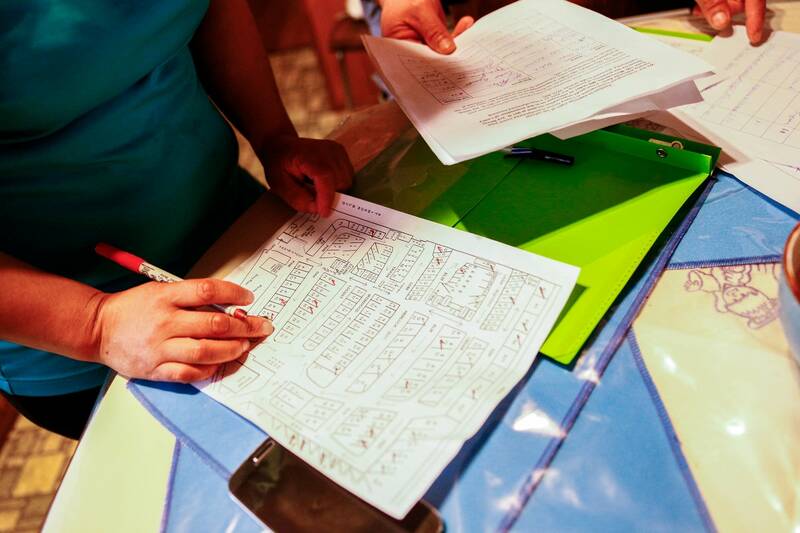 Getting the 51 percent of residents to form the co-op was easy, she said — finding the money to buy the neighborhood is not. Alvarez and her neighbors have mailed appeals to Minnesota foundations and philanthropists. On the top of the packet is a letter from Alvarez. Then, letter after letter — 30 in all — from kids who live in the park. "Our dream is to become a cooperative where we all own the land together," Alvarez writes. "Save the Grove!" read the letters underneath, in brightly colored markers. "I like it here," says another. "I don't want to go." So far, they've only received "no's." When Alvarez sits down with her daughter Melina to a meal of beans, tortillas and hot dogs, it's dinner for two. But there's a third face at the table: Traci Tomas. Tomas is the president of Continental Property Group, the developer who is planning to buy the park. 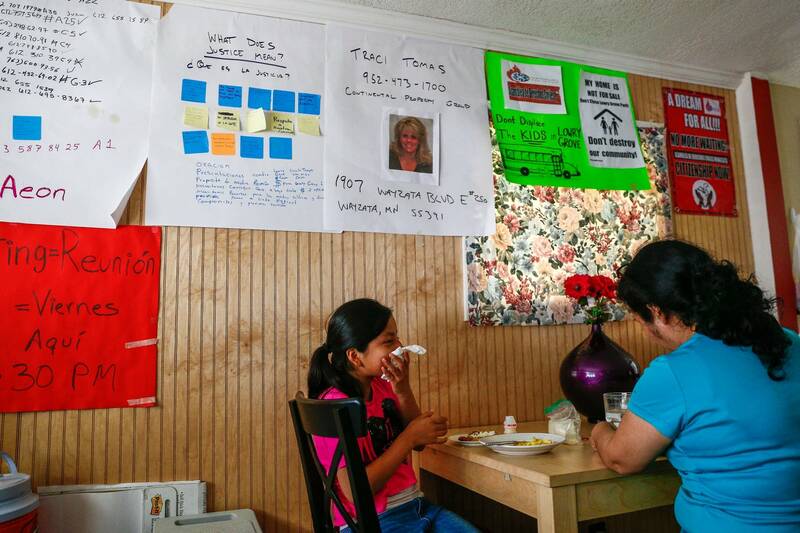 A poster of her face hangs in Antonia Alvarez's kitchen, her office phone number and address written out in block letters. Tomas has become Alvarez's focus as she tries to stop the park's closure. If the residents can't raise the $6 million, maybe they can convince Continental to maintain the park, Alvarez says. Maybe just for another year or two. Maybe longer. 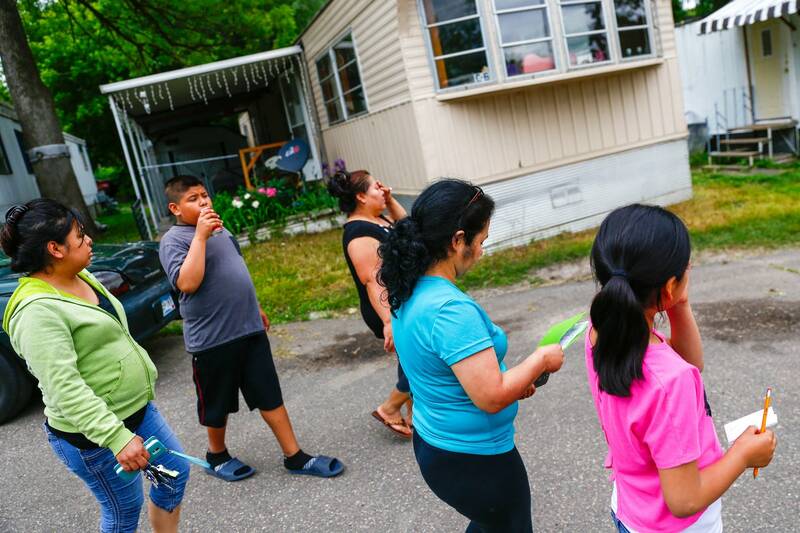 In May, Alvarez and Asamblea chartered a bus to Continental's Wayzata, Minn., office, bringing along more than twenty Lowry Grove residents, unannounced, to plead with Tomas to keep the park open. They also brought more letters, from the roughly 80 children who live in the park. Tomas listened to their stories. She understands the ferocity of their appeals. A house is "such a personal thing," she said. And she knows the houses in Lowry Grove. She used to work there. More than a decade ago, Tomas collected rents and followed up on late payments in her role as site manager. The faces in the park have changed some since she left, but she remembers their stories. She left after five years — she needed a break from the tough personal interactions that come with managing a residential property. Now, returning to Lowry Grove as a buyer has made her the face of the park's closing. She understands that, and she's given out her number to residents so they can call with questions about what will happen next. But when they ask her not to close Lowry Grove, Tomas said, her response is "not one that they like to hear." The sale is scheduled to close on June 13. The park closure letter will go out two days later. She wants to help people move on, because nine months after that letter goes out, they will have to do exactly that. "I'm certainly not interested in creating false hope for them that we are considering keeping it a manufactured housing community, because we're not," Tomas said. At this stage, the only certainty for the land is that the mobile homes will be gone. The future could include apartments or townhouses. It could include senior or affordable housing. All of that is still in development. In the April letter to residents, the park's managing partner, Phil Johnson, praised his former employee, explaining why he had accepted Tomas' offer. "Some of you may remember her as a very caring and compassionate person," he wrote. "She grew up in Columbia Heights and knows the area. She absolutely promises to do whatever is necessary to make sure all residents will be treated fairly." But Alvarez — and many of her neighbors — have a different definition of "fair." To Continental, what's fair is following the letter of the law and making sure residents understand their rights and the resources available to them. To Alvarez, it's not fair that this could happen at all. Continental has set up a website and a hotline for residents to learn about the closure process and relocation funds. It held a meeting for residents in May, two weeks after news of the sale broke, and distributed a list of parks within 25 miles that had vacancies. By state law, Continental didn't have to do any of this until after the June closing date. "I didn't want to wait," Tomas said. There's a lot to be done. Homes like Antonia's that are too old to move — and there are many — need to be appraised. Continental will pay owners the appraised values. Some residents of Lowry Grove have already begun that process. "There's probably about a dozen different residents that have contacted us and said, 'Come inspect my home, tell me what you could purchase it for, I don't want to wait. I want to get my kids settled before school,'" Tomas said. But that process doesn't satisfy Alvarez and many of the residents she's organized. What's the value of a mobile home that can't be moved? In a park that will be closed? How do you appraise a house that no one would ever buy? The appraisal can't possibly cover the investment she's made in her house, Alvarez says. The thought of a bulldozer crushing the walls of her home — she bought it with money from the sale of her mother's house in Mexico — makes her heart race. She wants to remain on her shaded lot. "I'm an organizer, but this struggle is very traumatic," she said. "I cannot believe I'll lose my house. This is very impossible, in my mind." What seems impossible to Alvarez, though, seemed inevitable to many others — including Phil Johnson. He and five others bought the park 20 years ago. Since then, the owners have fielded a lot of inquiries from developers, but Johnson has never accepted an offer. He was waiting for the right one. When Tomas, his former employee, approached him through Continental, the timing made sense. The sale of Lowry Grove comes down to age, Johnson said: The age of the park — and the age of the owners, who are now in their late 60s and early 70s. "The park is very, very old," he said. "It started many, many years ago — a little over 70 years ago. Most of the infrastructure dates back to approximately that time." 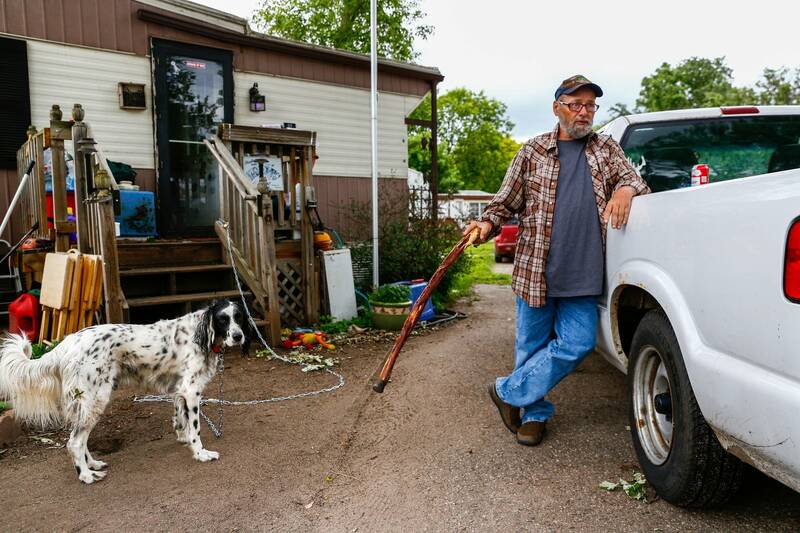 In manufactured home parks like Lowry Grove, the water and sewer systems are privately owned. Both need to be replaced. Lowry Grove's roads and electrical infrastructure are also stressed and aging. "The Park no longer meets the standards of modern manufactured home communities," Johnson wrote in his letter. Alvarez and other residents have the same complaints — the water tastes off and the roads are deep-pocked hazards. One resident said he saw a muffler fly off a truck when it hit a pothole too hard. When it comes to the letter, though, they cry foul: Selling the park because it's in poor condition isn't a valid excuse coming from the people who were supposed to maintain it. 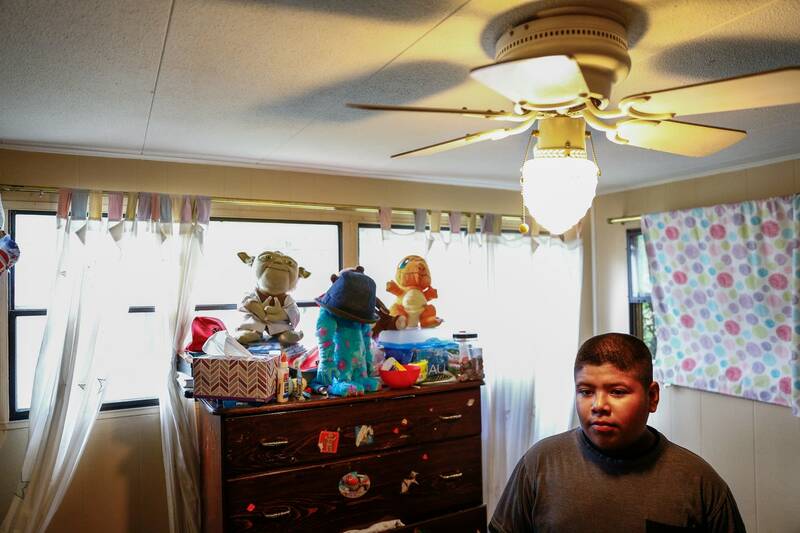 "I've lived in this mobile home for ten years," Alvarez said. "In ten years, I pay my rent, I pay garbage, water, everything. You can see the streets — they never fix nothing." Updating Lowry Grove isn't as simple as fixing a sewer or patching the potholes. Mobile homes from 50 years ago, which fill a significant portion of the park, are much smaller than their modern counterparts. Many of the lots can't accommodate newer models, which prevents people from bringing in new homes to replace the old ones. "Many of these homes were built before , so they weren't even built to code, and they've been here for 50 years," Johnson said. This tangle of maintenance and outdated infrastructure could be the thing that prevents Lowry Grove residents from pulling off the right of first refusal. First, they have to match Continental's offer of $6 million. But they would also have to come up with the financing to update the park. And it's unlikely a bank or credit union will want to invest in a mobile home park with expensive repairs looming. That's exactly what sidelined the only other exercise of first refusal that Dave Anderson, executive director of All Parks Alliance for Change, knows of. About ten years ago, residents of the Shady Lane mobile home park in Bloomington, Minn., successfully raised the funds to match a developer's purchase price. "They came up with a million in less than 45 days," Anderson said. But then they found out they needed another $1 million or so to address the park's infrastructure problems. "That's what ended up bringing that attempt to an end," he said. "Not being able to also come up with money on the quick time table for infrastructure repairs." Shady Lane was sold to a developer and closed. Then, the financial crises of the early 2000s delayed plans to build a 160-unit senior housing facility on the property. Much of the land remains vacant. "The highest and best use of the land"
While plans for the land under Lowry Grove are still in process, park residents got their first glimpse of what St. Anthony might look like without them when the city released its Comprehensive Plan in 2008. "Given the value of residential properties in the vicinity, mobile homes on the site represent an underutilization of the land," the report said. "The Lowry Grove Mobile Home Park could be privately redeveloped into townhouses and condominium apartments." The city hasn't played a role in the Continental offer, but some residents say the 2008 plan put a bull's eye on their neighborhood. The city's report included stock images of "potential replacement housing for the mobile home site": Modern-looking structures with manicured landscaping — and not a single mobile home in sight. Ned Moore, who works with Alvarez at Asamblea, disagrees with the park closure and planned redevelopment. Housing the current 95 households, he said, "is the highest and best use of the land." But some residents think the infrastructure issues facing Lowry Park are too big to overcome. "Power lines over there were shorting out last week. The sewers are all messed up. The water lines are always bursting. Let it go," said Roger Bilderback, who has lived in the park for six years. Bilderback's trailer is new enough that he'll be able to move it to another park if Lowry Grove closes. Barb Biorn's is not, but she's already come to terms with the loss. She's been digging up the flowers she spent more than a decade tending. "The irises, I'll take. I've got daisies, I've got a whole thing of lilies and phlox, and my mother's peonies from 1960," Biorn said. "It's going to be a lot of work, but it's all going with me. They're going to mow it down, mow it under, dig a hole." Biorn has lived in the park for 36 years. She raised her two children there. Before she received that notice in April, she was fixing up her home and hoping to sell it to a young family. "I'm retired. I've got 3 bedrooms. I thought: What a beautiful place to live. The school system's great," Biorn said. She spent thousands fixing it up, with plans to sell it this summer. Now, "they'll probably give me $2,000. I was going to sell it for $8,000 to $10,000." She plans to move to a house in north Minneapolis, and take as many of her plants as possible, though some, like the grape vines, can't be moved. After she received the April notice, she painted a sign and staked it in her garden: "Anatevka." It's the name of the town in "Fiddler on the Roof" — the one the Jewish families are forced to leave. "In the end, they're all packing up on their wagons," Biorn said. "And they don't know where they're going, and they're not going to see the people they live with anymore. I thought it was appropriate." As Antonia Alvarez walks through the park, navigating potholes, her daughter Melina skips to keep up with her. She plays with a folded paper fortune-teller, reading the futures of people in the park: "You will be an actor in Hollywood." "You will have 3 dogs and 3 cats." "You will discover something new, like a flower, bird or sea animal, etc." Many of the Spanish-speaking residents have formed a tight-knit community in Lowry Grove. Far from home — which, for most, means Mexico, El Salvador, Guatemala and Ecuador — they have become an extended family. Walk out the door of one home, and someone is leaning out the window of the next with a dinner invitation. Lowry Grove's closure would scatter them. 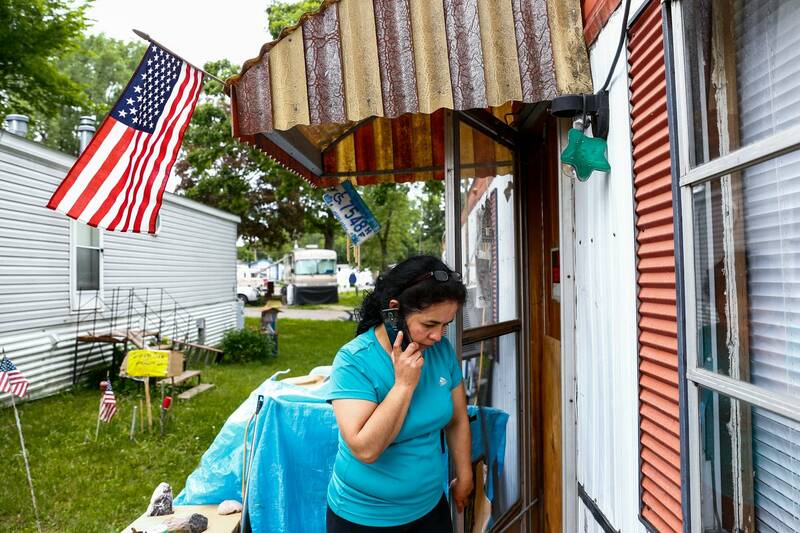 Many of the families live in 1960s-era trailers, just like Antonia's. They've fixed the roofs, the floors and the windows, just like Antonia. And their trailers can't be moved, just like Antonia's. Some plan to look for apartments, but staying in St. Anthony will be nearly impossible. The park's location is ideal — it's in a good school district, along several bus lines, within walking distance to grocery stores. But the vacancy rate in the area is near zero, said city planner Breanne Rothstein. Rent at Lowry Grove runs about $440 for a single-unit mobile home, and even one-bedroom rentals at that price "just don't exist" in the city, Rothstein said. Alvarez doesn't know where she'll go if the residents can't buy the park. She's used to being the one people come to for help. She's hosted college students who didn't have a place to stay, and single mothers and their children when they hit a rough patch. Her home is small, but she's opened it to anyone who needed a space. Being the one in need will require a different mindset, one she's not quite ready to adopt. For now, there are letters to send and numbers to call and people to ask. Tonight, she has another meeting in the park with a potential 11th-hour funder. They've invited representatives from Rep. Ellison's and Sen. Al Franken's offices, and the mayor of St. Anthony. She's cooking for everyone. These are the details she's juggling — not the details of moving. But if tonight is not successful, if Lowry Grove residents can't raise the funds, the sale will close on Monday. The day was already marked on her calendar, she said, long before that April letter arrived and set her campaign in motion, long before her home of 10 years suddenly didn't feel so solid anymore. "You know what it is? June 13?" Antonia asked. "It's my birthday."